If your internet connection speed is suddenly got down, then it might be possible that your neighbour or someone is also using your WiFi connection. Then you have to find out if someone is stealing your WiFi or not. As the number of devices using the WiFi connection increases along with the real-time uses, it will result in slow speed on all the connected devices. So, let’s check out how we can find out if someone is stealing your WiFi or not & how to block such devices from connecting to your WiFi? 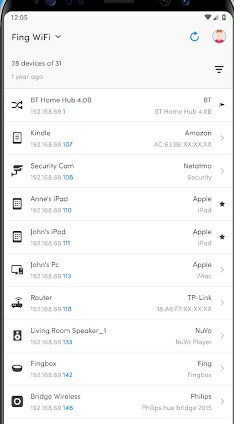 To find out if any unknown/suspicious device is connected with your WiFi, you can use various network tools or apps. One of such great apps is: “Fing: Network tool”. Let’s see how to use this app to know suspicious devices on your WiFi Network. Note: We are going to use “Fing” Mobile app for monitoring your Wi-Fi network, but if you want to monitor using your computer, you can use Wi-Fi Inspector, F-Secure Router Checker and Wireless Network Watcher, etc. Step 1: Open Play Store and download the “Fing” app. Step 2: First, connect to your Wi-Fi and then open the app. Step 3: You will see Settings and Refresh buttons above your Wi-Fi name. Step 4: Click on Refresh to see all the devices connected to your Wi-Fi network. This will take a few minutes. Step 5: Once that’s done, you can see the devices connected to your Wi-Fi. Now tap on any device, and you can see its log when it was connected and disconnected from the network. Step 6: Check for all connected devices and find the freeloader device. Step 7: Copy the device MAC address which can be seen in the “Fing” app. Once you know the suspicious device and got the device MAC address using the fing app, now you can easily block partially or fully that device from using your WiFi connection. This can be done from your router settings. Just follow the steps as given below. Step 1: The first task is to log in to your router on a computer. You can use the default username and password depends on your router manufacturer. Some combination you may try if you don’t know: “root, password”, “admin, password”, ” admin, admin” etc. Step 3: Under security, click on “MAC Filtering” and then tap on “Add Device”. Step 4: Now enter the MAC address of the suspicious device, also give it a name if you want to. Then Click Apply and then OK. Step 5: Once that done, you can check on Fing, the same suspicious device won’t be connected. To better safeguard change your Wi-Fi password as the last one got compromised.